It was the middle of January and I was on a beautiful coastal walk with the sun warming my skin and a gentle breeze cooling my face. To my left, fields of bright green clover, patches of fresh thyme and chamomile, and small stone goat sheds made from pinkish-white stones stretched up a hill. To my right, sheer cliffs dropped into the ocean, which stretched into the horizon. Behind me, a small ancient fort stood watch over the coastline. And ahead, a dusty, but well-kept path led over rocky beaches, deserted swimming areas, and clay mudslides, now dried in the sunshine. When I describe this January scene, where do you picture me? In South America, where January is summertime? In Ecuador or Hawaii, with their year-round mild climates? Because the truth is that this wonderful January walk happened in Europe—on a tiny island called Gozo. Gozo is a small island (with an area of just 26 square miles) in the Mediterranean, just south of Sicily. It’s the second largest island (after Malta itself) in the Maltese Archipelago. 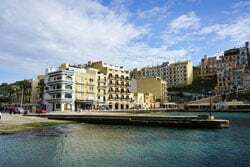 And it’s known for being a quiet, rural getaway, a retirement haven, and the home of a special, mild goat cheese called Ġbejniet, which tastes just a little like fresh mozzarella. In Gozo you can live a quiet, affordable, nature-surrounded life while being only a ferry ride away from the stunning island of Malta. During my short time on this pretty island—where every morning I woke to the sounds of birds twittering outside my windows and the smells of fresh bread and dried herbs—my main goal was to walk as much of its well-kept coastal pathways as possible. For a quick and determined person, a trip all the way around the coast would take about three days. But for me, the walks were leisurely and I tackled the coastline in pieces, taking breaks to explore the more active capital city of Victoria, to wander some of the island’s interior countryside, and to visit some ancient farmhouses and daydream about what it would be like to settle into this sunny little island and open a B&B. In all, I spent about a week on Gozo and made it about a quarter of the way around the coast, with my favorite walk being between the popular seaside village of Xlendi and the majestic Ta Cenc cliffs. Of course, the coastal walks aren’t the only attraction in Gozo. Activity-wise, it’s also known for its diving and many of the friends I made on the main island of Malta praised Gozo for its food (a praise I must agree with). It’s one of the easier places in Europe for American retirees to get residence visas. And as a part of the Maltese Archipelago, it’s ranked as the fifth best healthcare system in the world, according to the World Health Organization. In my own experience, it’s also affordable, with rooms in old stone farmhouses in the countryside and lofty B&Bs in the capital listed under $100 a night—and long stays available for as low as $250 per month in a one-bedroom rental apartment. Groceries are comparable with other European towns. Bus tickets cost $1 for the whole day (and 50 cents for resident seniors)—and pets ride free. A meal at a fancy restaurant with homemade pastas and local liquors is $25. A round-trip ferry ticket to the main island is $5 for tourists and under $2 for residents. And healthcare—even for those not covered by the Maltese system—is low-cost, as well, with a four-hour hospital stay, including blood tests and saline drip, running about $150. So it would be easy to live well on a small budget here in Gozo, surrounded by fresh, local food, quiet natural areas with well-kept walking paths, friendly, helpful people (as one expat said “the people here always have time for you”), and easy access to lively Victoria, where you’ll find shopping malls and organic food shops, sports centers and fine dining. 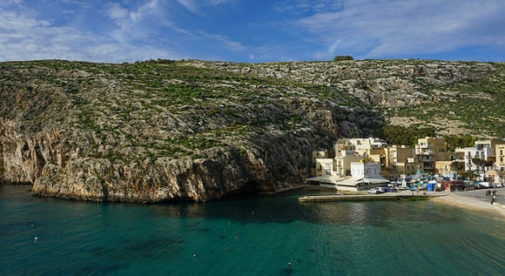 And while living a quiet, affordable, nature-surrounded life, you’d be just minutes away from the main island of Malta, where an international airport, the ancient and beautiful port city of Valletta, and the even older, walled former capital city of Mdina, where you’ll find a moat converted to a garden and maze-like paths that lead to Italian- and Arabian-inspired restaurants, all await. Simply provide your email below to receive the Free report. You’ll also receive a free subscription to our International Living Postcards – a daily e-letter that explores living, traveling and investing in Malta and other exciting countries from around the world.